Another Chardin monkey comparison, this time with his own work. On the left is a portrait of artist, art dealer, collector and teacher, Joseph Aved, painted by Chardin in 1740. 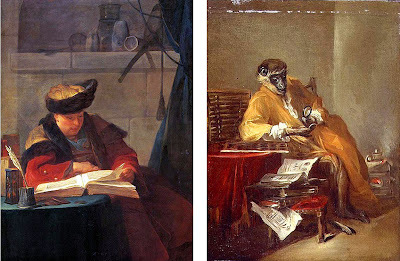 Aved was apparently both Chardin and Boucher's tutor and by the looks of it, the model for The Monkey as Antiquarian (right; circa 1740). While Aved is pensively reading from a heafty tome, the monkey excitedly studies his new find, a coin - ready to be placed in a coin album sitting on the table. There are two versions of this painting - the one below and another one, reversed with an oval framed vignette. I'll post an image of that one tomorrow.